Leros is one of the loveliest islands of the Dodecanese island complex, in the southern Aegean Sea. The municipality of Leros numbers few islets, most of which are uninhabited. It is also called the island of Artemis (the goddess of hunting) and probably, there was a temple dedicated to her. Leros played such an important role during the Peloponnesian war that was mentioned by the Athenian historical and general, Thucydides (460 B.C.-395 B.C.) in his “History of the Peloponnesian War” recounts. Later on, in 1309 A.D. Leros was defeated by the Knights of St John (also known as Hospitallers). Afterwards, this island was besieged several times by the Ottoman Turks without any success, before it finally became a part of the Ottoman Empire. In 11th century A.D., the “Kastro tis Panagias” or the “Kastro tou Panteliou” was built by the Byzantine Emperor Alexios Komninos. It was built upon the relics of an ancient fortification that according to findings, dates back to the 7th century A.D. This castle was further fortified by the Knights of St John and had been protecting the inhabitants of Leros during various attacks that were launched by the Pirates. It is built upon the bare Appitiki hill and the view from up there is stunning, to say the least. In the castle, there is the church of Panagia, hence one of its names. Apart from all these lovely sites, there is also a worth-visiting ecclesiastical museum which houses vestments, ecclesiastical books and icons. Every year, on August 15th, a feast is held in there in honor of Mary, the Mother of Jesus. In the area of Lakki, there is the church of “Agios Ioannis o Theologos”. The amazing mosaic of this church was created in the 11th century and is of rare beauty. Leros has indeed plenty of beautiful churches such as the picturesque chapel of “Agios Isidoros”, near Kokkali and the church “Agia Kouria”, built in the 18th century and known for its pioneering, non Byzantine-like icons. Leros has a unique War Museum, devoted to World War II period, that in fact operates inside tunnels that were created by the Italian army in 1930′s. There is a large number of unique exhibits of that period that are truly interesting. One of the famous beaches in Leros is Alinda, which is surrounded by sweet-smelling pine trees and ideal for those who love water sports such as water ski. If you like surfing, you should go to Gournes beach, northwest to Alida. Panteliou beach is also a very popular beach in Leros which is ideal for those prefer sand and for those who prefer pebbles, for you can find both of them in a single beach! Lastly, Ksirokampos beach is perfect for those who prefer unorganized beaches! Before you leave Leros, you should try plenty of fresh fish and mizithra cheese! Taste its delicious honey and of course, do relish local sweets such as sviggoi, pougkakia and kserotigana! 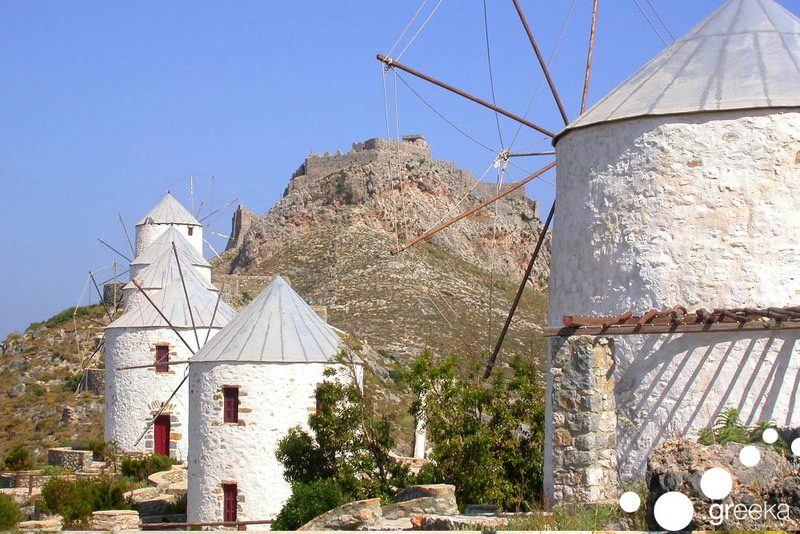 Discover more about Leros island.